How did patient hear about The Grand Pavilion: Daughter of patient decided on The Grand Pavilion by seeing our outstanding reviews online. Mr. Thomas Cardinale was admitted to The Grand Pavilion on September 17th, 2018. Mr. Cardinale had experienced sepsis due to Pseudomonas, chronic respiratory failure, injury of the spleen, generalized muscle weakness, and difficulty in walking. Upon arrival to The Grand Pavilion, Mr. Cardinale and his family were greeted by the nursing team and our concierge, Mark, and then went on to meet with our rehabilitation team, dietician, and social worker. The whole team was excited to get to know Mr. Cardinale. Thomas is an extremely personable person. He is people-oriented and gets along with everyone. Mr. Cardinale entered The Grand Pavilion with the hopeful goal of rehabilitating and returning home safely. Mr. Cardinale shares a loving relationship with his wife and has two beautiful children and four beautiful grandchildren. He and his wife live on the water and enjoy both the scenery and sunrise/sunset together. Mr. Cardinale served as the Vice President of Technology Development at a major bank corporation. Though he is currently retired, he serves as the President of his Home Owners Associates. His hobbies include golf and sports and he is a huge Oakland Raiders fan. During Mr. Cardinale’s initial evaluation, he was presented to the rehabilitation team with generalized weakness and poor standing balance. Thomas would require extensive assistance of one person with bed mobility, transfers and ambulation using a walker. Mr. Cardoline required oxygen (O2) at 3 liters per minute (LPM), and this had a part in limiting his mobility. Thomas was in need of greater safety awareness, an increase in functional activity tolerance, an increase in lower extremity range of motion, and an increase of general strength. It was the short-term goal of the rehabilitation team to increase Mr. Cardinale’s bilateral extremity strength and facilitate improved functional mobility and to improve limb stability during gait. Another short-term goal was to allow for Thomas to safely perform functional transfers, ambulate on functional surfaces at least 30 feet and safely ascend and descend 2 stairs with moderate assistance using handrails. 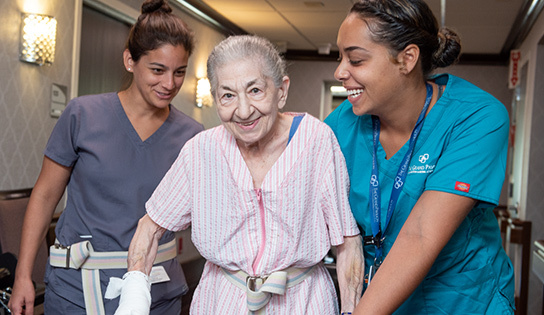 The rehabilitation team worked with Mr. Cardinale towards the long-term goal of walking 200 feet with only supervised assistance, ambulating with a normalized gait pattern, be able to safely ascend and descend 15 stairs with supervised assistance and in general completely reduce the risk of falls. Mr. Cardinale has made significant progress during his month and a half spent in skilled rehabilitation sessions. Thomas is progressing to the point where he is walking up to 150 feet with normalized gait pattern and increase overall functional endurance. Thomas has gone from needing maximum assistance with all activities of daily living, transfers, sit/down mobility to only needing standby assistance. Thomas has made tremendous gains with his dynamic balance and standing tolerance. Thomas is upbeat and motivated throughout the entire journey. When our Director of Concierge met with Thomas closer to his discharge date to discuss his feelings towards the care he received, Thomas was full of appreciation. He expressed his appreciation for the nursing team and how they were always there for him whenever he needed them. Thomas was extremely appreciative towards the rehabilitation team. He expressed how timely they were and how they pushed him to maximize his rehabilitation potential. We are proud that we are able to be a part of walking Mr. Thomas Cardinale through the journey of rehabilitating and returning home safely.